Cranberry Fireball Cocktail is a perfect cocktail for the holidays, when cranberries are just wrapping up their season and their festive red color just screams out holiday celebration! It’s easy to make this a virgin (non alcoholic) cocktail as well, just leave out the fireball. It makes a delicious option for those who don’t drink alcohol and even for those who do (sometimes a little fancy sparkling water is a great alternative!). I recommend using the Cranberry syrup I previously posted, but you could also use cranberry juice if you want to grab something quickly at the store. You can use any type of sparkling water, club soda or tonic that you have on hand or prefer. 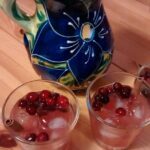 This recipe describes making four cocktails in a pitcher (and you could do the same for mocktails) but you can also make them individually in glasses. Easy to divide or multiply to make more or less! You can also mix this in a quart jar at home (you’ll need to slightly reduce the water for that to work and leave out the ice) for easy travel to take to a party or picnic! A delicious cocktail or mocktail (just leave out the fireball) for the holiday season! 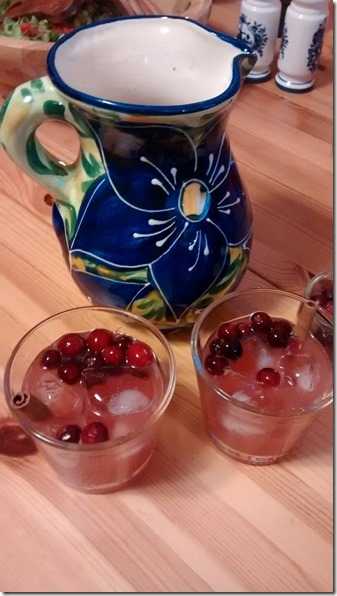 Celebrating the festive local cranberry! 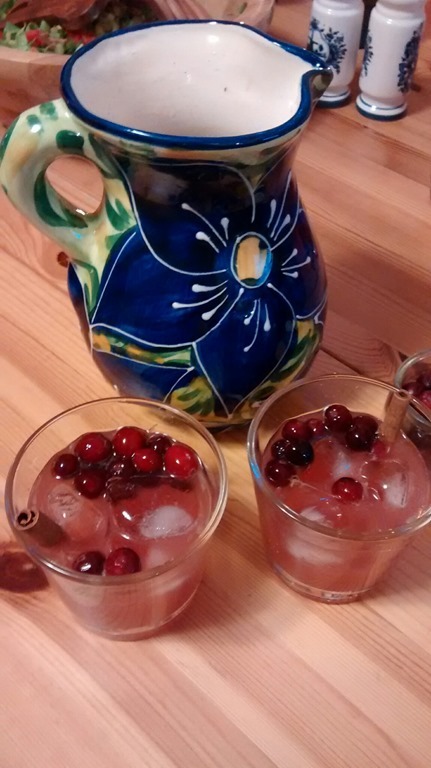 Mix all the ingredients together in a pitcher (except for the handful of cranberries and the cinnamon sticks). Pour into four glasses, add a few cranberries and a cinnamon stick for garnish!